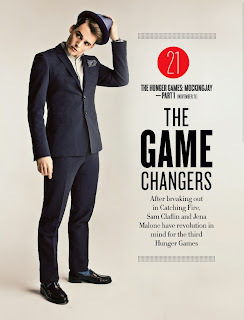 While we're waiting for the promotional campaign for Mockingjay to officially kick-off, Empire Magazine have brief interviews with Sam Claflin and Jena Malone in their February issue. "Every time I see Francis I’m convinced he’s not going to know who I am… I mean, I’m not the Finnick in the book. I’ve got brown hair, a beard, I’m a bit overweight, not 24 and I’m not seven foot… I was fully ready for the fans to hate me!" "I’m honestly so scared about saying anything at all, even though, as you say, the books are out there. But you see more of Finnick. No, not like THAT. More of his reasons for being how he is. Oh, you know what I mean!"